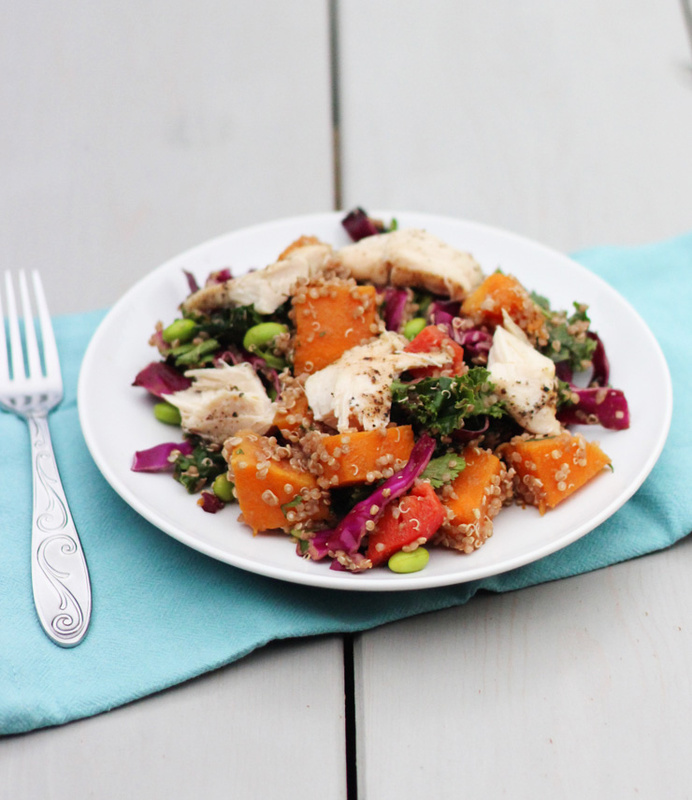 I had the hardest time naming this Chicken and Quinoa salad, and I am still not sure if I’m happy with the name. Most of the ingredients seem like the main ingredient. 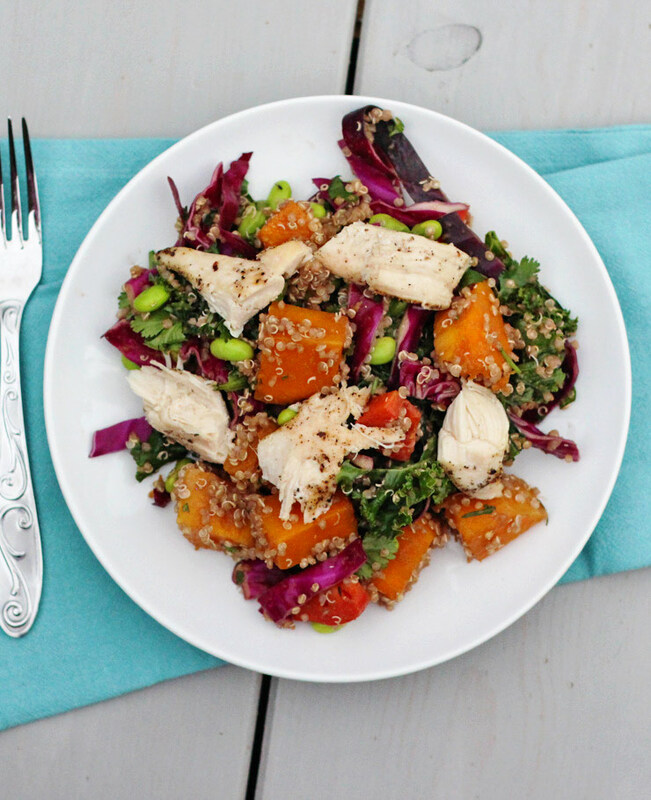 But, Chicken, Quinoa, Cabbage, Kale, Butternut Squash Salad seems like too much. Regardless of what you call it, it is delicious and has lots of healthy stuff in it. I have to admit that I have not been eating as healthy as I should lately, so I was definitely due for another recipe full of lots of vegetables. 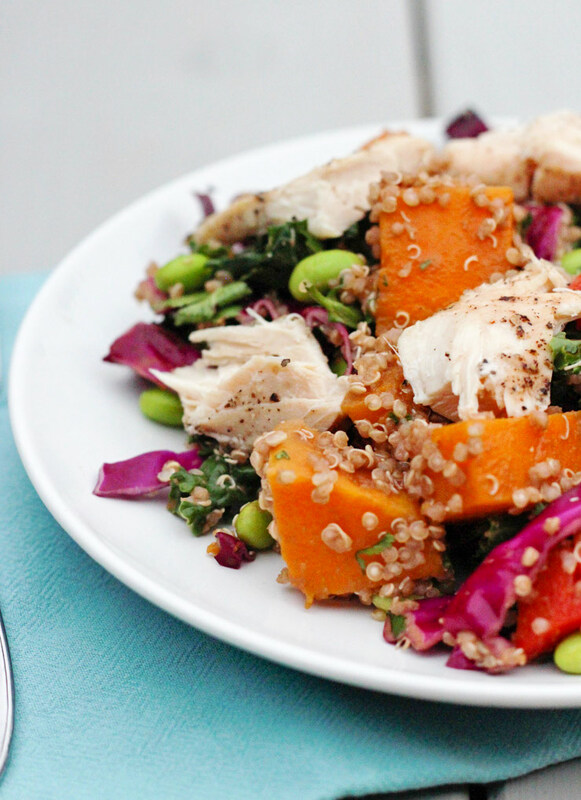 But, as you will taste with this salad, healthy can be just as tasty as unhealthy. I think I just fall back into unhealthy out of habit sometimes when I am particularly busy because I don’t have to be as creative, but, really creative is so much better, and so much more fun! Place chicken in a baking dish and brush lightly with olive oil and sprinkle with salt and pepper. Bake until cooked through. The time will be dependent upon the the thickness of your chicken, but mine took about 30 minutes. Place cabbage and kale in a very large bowl. When quinoa finishes cooking, pour it into the bowl with the cabbage and kale while it is still hot. This will let the cabbage and kale cook just slightly. When cooled to room temperature, stir in squash cilantro, edamame, and red bell pepper. When chicken is finished baking, cut into bite sized pieces and stir into salad. Whisk together dressing ingredients and pour over salad, tossing to coat. This may be served immediately or refrigerated for several hours before eating.